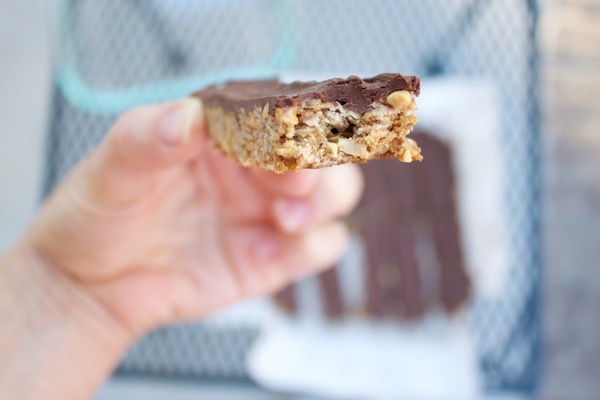 These chocolate peanut butter flax granola bars bring me great joy. 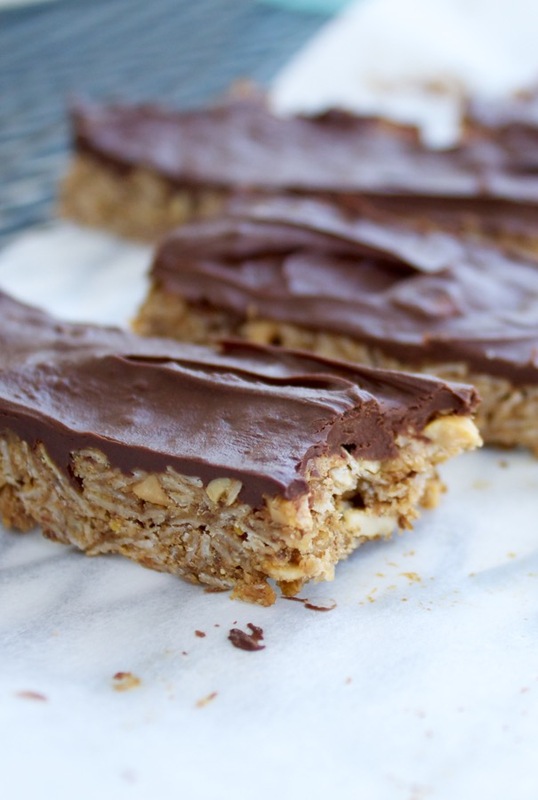 They taste a lot like a candy bar, but they’re full of healthy stuff (oats! flax! nuts!) and aren’t nearly as indulgent as that blanket of chocolate makes them look. They’re chewy, peanut buttery, sweet and salty, and I keep running out of the ingredients because I can’t.stop.making.them. You start by combining oats, ground flaxseed, chopped peanuts, a little brown sugar, and kosher salt in a big bowl. (Try to keep any helpful 2-year-olds from eating all of the brown sugar out of said bowl while you’re not looking.) Mix peanut butter, honey, a little oil, and vanilla into a thick, drizzly liquid that binds the dry ingredients together. Press it all into a pan, and bake! Sprinkle chocolate chips on the bars as soon as they come out of the oven. After a minute or two they get soft and melty, and you can spread them out like icing! This method makes a rich, beautiful chocolate layer on top of the bars without any extra effort (for a second I thought about dipping cut bars into chocolate, like KIND bars, but ain’t nobody got time for that. This is so super simple!). Plus, you get to lick that spatula. 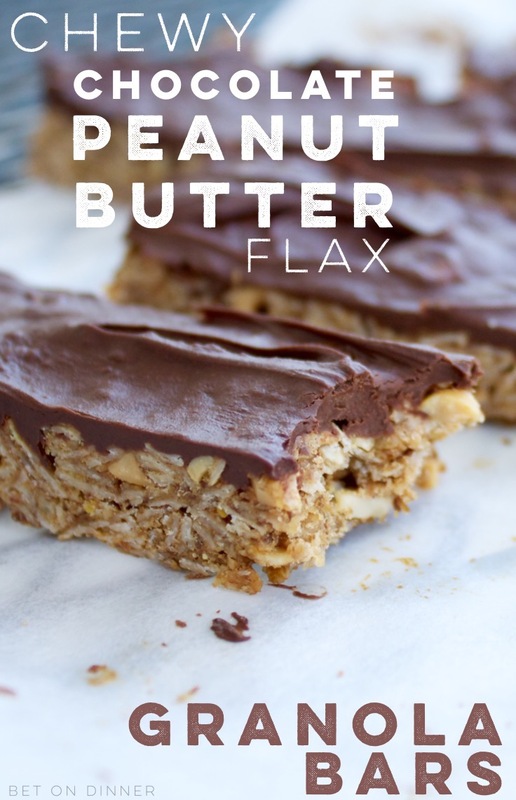 If you’re a fan of these chocolate chip granola bars, I used that recipe as the jumping off point for this peanut butter version. Oh, and you could definitely make these minus the chocolate, if you wanted them to seem a little breakfast-ier or something. But that makes my heart hurt a little, so maybe just cut them smaller and tuck them into lunchboxes and eat them outside on crisp fall afternoon walks and standing over your sink pretending to be doing dishes (no, I’m not chewing anything, dear children!) and as a we’re-out-of-dessert dessert. 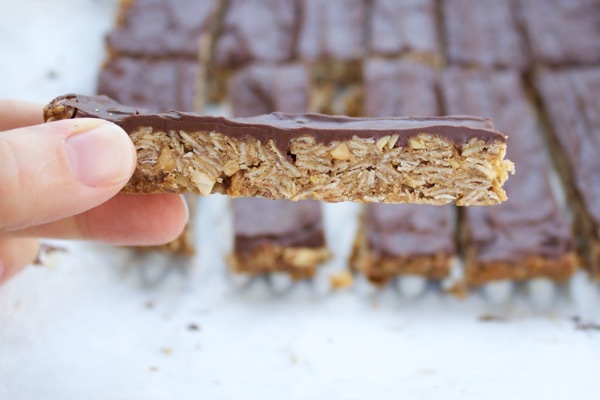 Chocolate Peanut Butter Flax Granola Bars. Preheat oven to 325. 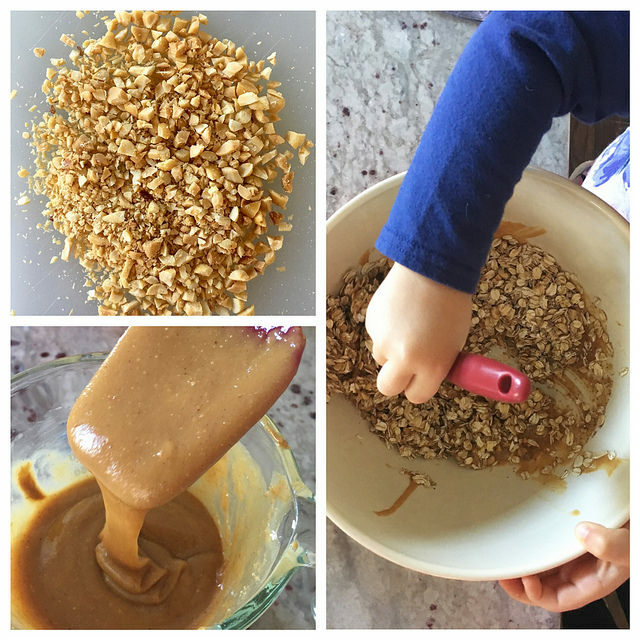 Combine oats, peanuts, flaxseed, brown sugar, and salt in a large bowl and stir to mix. Measure the peanut butter with a regular measuring cup (the one you used to measure the peanuts and flax! ), then transfer it to a glass 2-cup liquid measuring cup (or other microwaveable bowl) and microwave for about 30 seconds, until it’s melty. Add the honey, oil, and vanilla to the measuring cup or bowl and mix. Drizzle liquid ingredients into dry ingredients and stir until thoroughly combined. Press the mixture into a parchment paper lined 9×13 baking pan, pressing it down very firmly. Bake for 30 minutes until lightly browned. As soon as you take the pan out of the oven, evenly scatter the chocolate chips over the surface of the bars. In 2 minutes, they’ll be melty and spreadable. 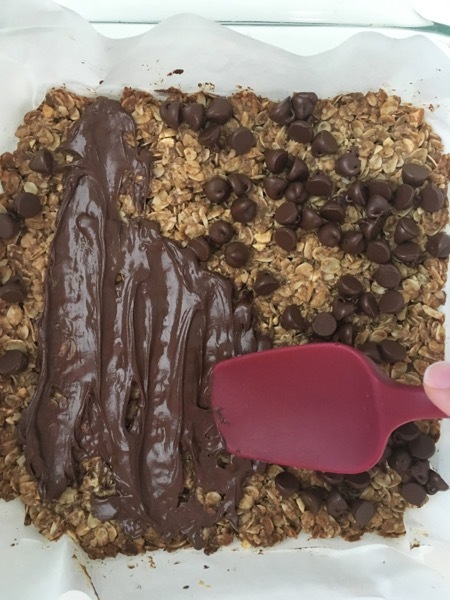 Using a spatula, spread the melted chocolate over the top of the bars. Let them cool completely (a couple of hours for best results – if they’re warm when you cut them, they’ll be more crumbly) before cutting into 24-30 bars. This recipe is adapted from my chocolate chip granola bar recipe. I was low on ingredients, so the pictures are a half recipe baked in an 8×8 pan so they look a little thinner than a full batch baked in a 9×13 pan will be. I knoooow, I kept thinking about how deprived you would feel! ???????? Haha, you deserve some! ??? ?